The following plans describe a method of adding MIDI capability to the Moog Source analog synthesizer for $99 with the Synhouse MIDIJACK. Some drilling is required. There is plenty of space on the Source to mount the MIDIJACK with the provided hardware. The installation of the MIDIJACK in a Source is one of the easiest modifications of all. In fact, with the MIDIJACK, it is possible to convert the Source to MIDI without even removing a single circuit board from the instrument! The correct analog I/O signals are easy to find and connect to the MIDIJACK. Like many older American synthesizers, the Moog Source has panel-mounted CV/gate jacks with solder lug terminals and the MIDIJACK wires can simply be soldered right inside the panel and the whole MIDI conversion job can be done in 30-45 minutes. The 1/4" jacks do not even need to be unscrewed from the back panel. They may be left in place and soldered right on the spot. You can do this yourself if you have a little experience with electronic repair and the soldering of wires and circuit boards. If not, these plans may assist a professional repair shop installing the MIDIJACK for you. The particular installation on which this document is based was on Moog Source serial #2649, other revisions may be different. It is best to download these notes and photos and print them out on paper to look at while working on the instrument and make notes and check off the steps as you go. As with any project, you should completely read and understand each step of the instructions before starting. All repairs and modifications made to your instruments will be done at your own risk and Synhouse Multimedia Corporation assumes no liability for personal injury caused or damage to equipment or loss of use caused directly or indirectly by the use of these plans. If in doubt, don't do it! 1) Be sure to have the correct tools and supplies for for the job. If you do not have them, get them. You will need a regular size Phillips screwdriver, a smaller size Phillips screwdriver, needlenose pliers, wire cutters or other flush cut nippers, a hobby knife such as an X-Acto, scissors, a soldering iron, solder, electrical insulating tape, and a black Sharpie permanent ink marking pen. If you intend to mount the DIN jack on the back panel with the rest of the jacks (highly recommended), it is best to use a chassis punch (a small hand tool that safely cuts a clean hole in a metal panel) to make the hole for the DIN jack, and an electric drill with a 1/8" or similar size drill bit to drill holes for the 4-40 hardware used to mount the DIN jack, and also a 1/4" or 5/16" drill bit to make a pilot hole to start the chassis punch. The correct size for mounting a MIDI DIN jack is 14.5 mm metric or 5/8" SAE (.62"/15.9 mm) in American sizes. A chassis punch may be purchased from any good tool or hardware store. If it is more convenient, a punch may be mail ordered via internet or telephone from Mouser Electronics at http://www.mouser.com or (800) 346-6873. The Mouser part number is 586-3803 for the name-brand Greenlee 730-5/8 (about $30). The cheaper house brand part number is 380-0145 (less than $20). The service from Mouser is unpredictable and the house brand ordered by Synhouse for the test installation took three months to be delivered, while the Greenlee part was delivered in one week. Mouser refused to give even a small discount to customers of Synhouse, so no recommendation is deserved or being made here, and any other source you know of to buy this type of tool is highly recommended and certainly a better place to buy from for all of your needs now and in the future. You will also need an 11 mm wrench (for Greenlee) or 1/2" wrench (for the Mouser house brand punch) or adjustable wrench to turn the chassis punch while cutting the hole. An automatic center punch would also be useful. This is an inexpensive spring-loaded pointed punch that can mark your drilling spot without the use of a hammer. Marking the holes with this small indentation will allow you to drill cleanly without slipping and scratching the synthesizer or drilling through your knee. 2) Fully test the Moog Source to be converted to MIDI. Be sure that all functions such as the envelope generator work and that the instrument plays in tune while playing along with a known well-tuned instrument such as a newer digital synthesizer or sampler keyboard. If it doesn't work properly without MIDI, it certainly won't work with it. 3) Extreme caution should be taken while working on the Moog Source. The unit should be unplugged while open and even then, the power supply may pose some electric shock hazard due to residual voltage in the power supply. Also note that the Moog Source is considerably more complicated than other old monosynths and has many connectors that go from the upper case to the lower case and could become strained or broken if the two halves are pulled too far apart. 4) Remove the six Phillips screws that hold the lower case in place. Four are on the bottom near the corners and two are on the rear panel near the lower edge. Carefully lift the top half of the case and tilt it upright on the back panel so you can see both upper and lower circuit boards from your work position. Be careful not to drop it. 6) Determine the place where the MIDIJACK circuit board will be mounted and test fit the board into its' correct place inside the case. One place to mount it is on the front panel to the right of the volume control. The Source is fairly small and has a lot of circuitry inside, and many places on the panel that look like a good mounting spot while looking from the outside actually have circuit boards or blocks of wood on the inside. You may choose your own mounting location, but be careful to avoid putting the board or wires near the high voltage transformer and fuse connections in the rear of the instrument. The MIDIJACK hardware packet has paper drilling templates for easy installation. Use the paper drilling template labeled MIDIJACK Board Mounting to properly mark and drill the holes. The photo called Source pic 1 shows the paper drilling template in place. Once taped in place, the holes may simply be center-punched and drilled through the paper. The perfect size drill bit for the switch stem and two screw holes is 9/64", and the perfect size for the scale adjust trimpot is 3/16". Drill the holes. The photo called Source pic 2 shows the location of the newly drilled mounting holes. 7) Temporarily mount the MIDIJACK board in place. When mounting the MIDIJACK board, the switch should be fitted so well in the panel that the switch stem will not wiggle at all once in place. It should not have any free play but also should not be so tight that it binds. When the switch is pressed, it should have a definitive "click" and bounce back like the button on a new VCR. You will never regret spending too much time on this and good attention to detail will make the perfect MIDIJACK installation. The hole in the panel that is over the MIDIJACK scale adjust trimpot should be about 3/16" so a Synhouse Pocket Screwdriver can fit through the panel for periodic adjustment. Once the fitting is correct, remove the board. Although the MIDIJACK gets power to operate from the synthesizer in which it is installed, it has a very high-quality regulated supply of its own which allows it to operate with an unregulated input. In the case of the Moog Source, there may be some digital switching noise or other irregularities present in the +15v supply. As an extra precaution to help stabilize any voltage ripple which may become audible in the form of unwanted noise vibrato in the CV, two solder pads have been placed on the lower side of the MIDIJACK board to solder a 100 uF/25v (or greater) radial-lead electrolytic capacitor in place, upside-down, under the board. The pads are on the end of the board nearest the header for the wiring harness and the positive side of the capacitor should go in the square solder pad marked with a + on the silkscreen. 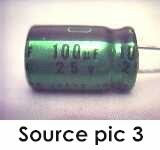 Such a capacitor is seen in Source pic 3 and is readily available from any electronic supply store, even Radio Shack with their part number 272-1028. It may not be necessary to add this capacitor, but it is a good idea. This extra capacitor may be added in any other MIDIJACK installation as well, but extensive testing has proven this to be completely unnecessary. Remount the MIDIJACK board and tighten the screws. 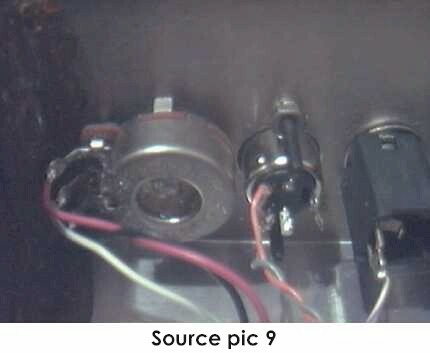 The installation of the board with extra capacitor can be seen in Source pic 4. 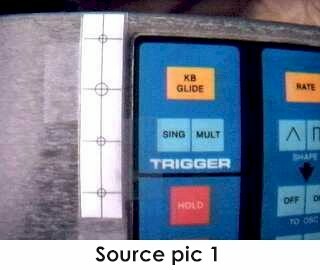 The completed MIDI control panel installation is shown in Source pic 5. 8) Determine the place that the MIDI input DIN jack will be mounted. 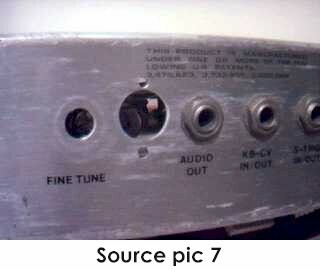 A good place to mount it is on the back panel between the FINE TUNE knob and the AUDIO OUT jack, as photographed in this example. There is a not a lot of room behind the rear panel of the Source, so you may be limited in your choice for suitable DIN jack mounting locations. The way to make this look like original Moog factory equipment is to mount the DIN jack outside the metal panel (to match the look of the CASSETTE INTERFACE DIN jack if so equipped) instead of inside the panel as in a normal MIDIJACK installation. To do this, mark one of the two wires (#9 orange or #10 gray) at the terminals of the DIN jack with a marking pen or tape to remember the polarity then desolder both wires. 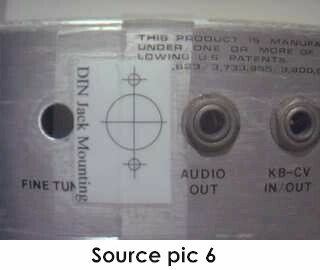 Remove the FINE TUNE knob and potentiometer for easier access to the panel, and use the paper drilling template labeled DIN Jack Mounting to properly mark and drill the holes as shown in Source pic 6. It is advisable to use a chassis punch to make the hole for the DIN jack. Remember that the DIN jack is to be mounted with the smaller 4-40 hardware size rather than the larger 6-32 size that secures the main board. Drill two holes for the screws then drill a slightly larger hole in the center to act as a pilot hole for the chassis punch. Use the chassis punch to cut the hole and be sure that the wrench is turning the tool from inside the Source, not outside, so the cutting edge is coming from the outside. This will ensure that the outer edge is perfectly smooth. 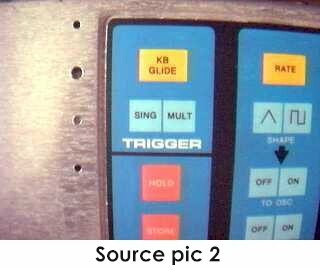 The properly cut mounting holes may be seen in Source pic 7. The MIDIJACK hardware packet contains both long and short 4-40 screws for the DIN jack. Use the two long ones for installation on a thick aluminum panel such as the Source. When all three holes are perfect, put the DIN jack in place outside the chassis and secure with the two screws from the outside, and the four split washers and two 4-40 nuts on the inside and tighten with a small Phillips screwdriver from the outside and needlenose pliers from the inside. These nuts should be very tight. By using the Synhouse paper drilling template, a center punch to start the drill, and a chassis punch, your Source will look like it had MIDI when it came from the factory, as in Source pic 8. Reconnect the wires to the DIN jack at this time. Reinstall the FINE TUNE potentiometer and knob, but rotate the position 180 degrees so that the solder terminals and wires on the potentiometer will be clear of the newly mounted DIN jack. This new arrangement can be seen in Source pic 9. 9) The wonderful thing about installing the MIDIJACK in a Moog Source is that all five necessary wiring connections can be made to the back of the existing analog interface jacks and a single circuit board in the Source (on the top side that is easily accessable) and the entire modification can be performed without removing any boards from the instrument. The Source has panel-mounted 1/4" jacks. 10) The MIDIJACK #1 black and #2 red wires must be soldered in place to get the ground and power for the MIDIJACK. Locate IC U23 near the rear center of the analog board. Resistor R57 is just to the right of it. Solder the MIDIJACK #1 black wire to the circuit board trace connected to U23 pin 7, the ground pin of the chip. 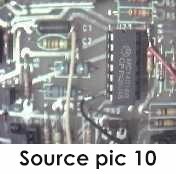 This PCB trace is at the lower left of the chip and goes to the left, and can be seen in Source pic 10. Solder the MIDIJACK #2 red wire to the lead of R57 which is nearest the rear of the instrument, the end of the resistor which goes to U23 pin 14, the +15v power pin of the chip. Make these connections very carefully. Please note that the beige wire further to the left of IC U23 is not related to the MIDIJACK, it is a Moog factory-installed jumper wire used to correct a factory defect in the design of the Moog Source photographed here and should not be touched. 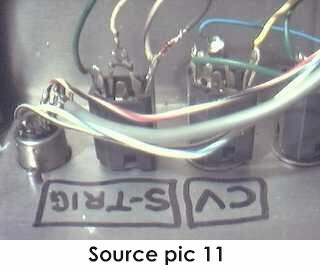 11) Locate the factory Moog wire which is white with black and brown stripes and is soldered to the back of the KB-CV IN/OUT jack. This wire connects to the ring of the KB-CV IN/OUT jack. Remove the wire from the solder terminal by desoldering it. Solder the MIDIJACK #3 blue wire to the now-empty isolated CV terminal. 12) Solder the MIDIJACK #4 white wire to the now-disconnected factory Moog wire which is white with black and brown stripes. Carefully wrap the solder joint with electrical insulating tape. 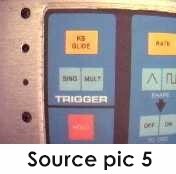 13) Moog synthesizers generally do not disconnect the keyboard from the trigger circuit with a switched jack as they should. For this reason, the local keyboard will still trigger the envelope generator even with the MIDI activated. The MIDIJACK #7 brown wire (S-trigger wire) must then be connnected in parallel with the existing trigger wire. A small signal diode can be inserted to isolate the signal so the local keyboard will still work when the MIDI is turned off. The correct type of diode is included with the MIDIJACK in the accessory packet, but may also be purchased locally at any electronics store such as Radio Shack as a 1N914 or 1N4148 or equivalent type of switching diode. 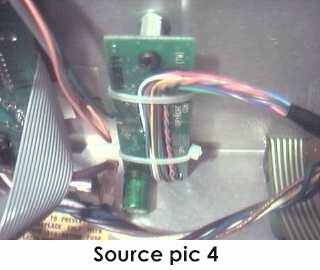 Locate the factory Moog wire which is white with violet stripes and is soldered to the back of the S-TRIG IN/OUT jack. This wire connects to the tip of the S-TRIG IN/OUT jack. Leave it connected as it is and solder the anode end of the diode (the end AWAY from the little black band) to this point and solder the MIDIJACK #7 brown wire to the cathode end of the diode (the end with the little black band). In summary, the MIDIJACK #7 brown wire goes to the band end of the diode, the other end of the diode goes to the same terminal on the trigger jack that still has the white wire with violet stripes soldered to it. There will now be a factory wire AND a diode connected to this terminal of the jack. 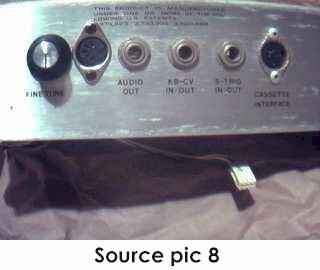 The finished connections can be seen in Source pic 11. Please note that this connection is correct but is different from other Moog installations described in the MIDIJACK Quick Installation Manual. 14) The MIDIJACK #5 yellow wire, #6 green wire, and #8 violet wire (unless it is used for a special function as described in the Advanced Installation Manual) are not required for for adding MIDI to the Moog Source, but it is a good idea not to permanently cut these wires off, as an alternate installation method may become useful later. It is best to wrap the ends of these unused wires with electrical insulating tape and bundle them with the other wires when finishing the installation. 15) The MIDIJACK hardware packet contains nylon cable ties which should be used to tie the MIDIJACK wires into little bundles and to attach them to the factory wires inside the Source now that all connections have been made. This will secure the MIDIJACK wires so they will not rattle and break loose inside the case once the instrument is returned to service. 17) Close the instrument and replace the six Phillips screws that hold the upper and lower halves of the case together. Four are on the bottom near the corners and two are on the rear panel near the lower edge. 18) Test and calibrate using the procedures described in the MIDIJACK Quick Installation Manual. 19) This installation can be completed in 30-45 minutes. With the MIDIJACK, the Moog Source is perfect for computer-controlled live performances with real-time hands-on sound editing capabilities. The envelopes may be adjusted on the fly, the resonant filter dramatically swept with a fast spin of the incremental encoder, and the pitch and mod wheels work as always. The Moog Source is quite a bit different than other analog monosynths and the MIDI control that results from putting a MIDIJACK on it is different as well. 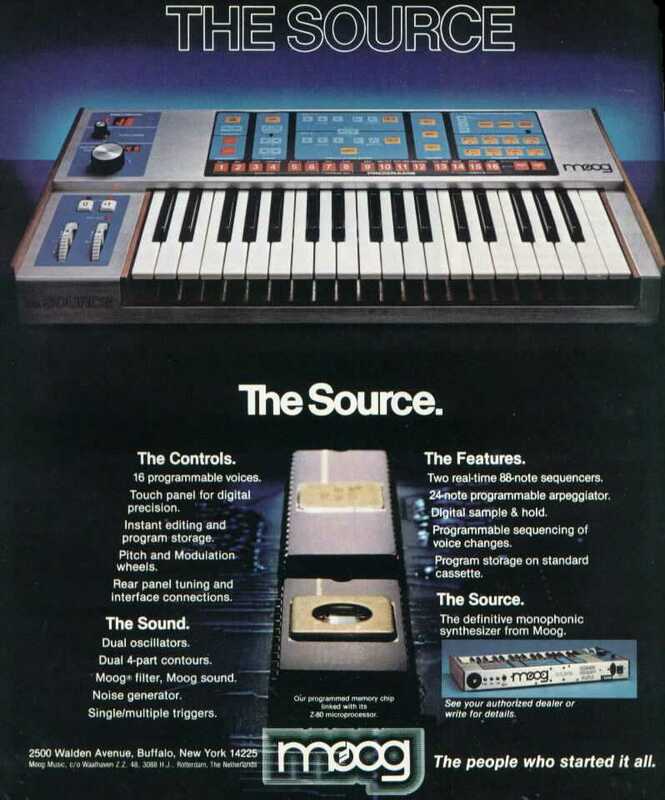 The lowest note on the Source keyboard is C, and when you send a MIDI C to it via the MIDIJACK, it plays a C on the Source. As always, the MIDIJACK can be put into MIDI on or MIDI off modes, but when using MIDI to control the Source, the local keyboard may be played as well, even while it is in MIDI on mode, just like with any factory MIDI keyboard. In this installation, the keyboard voltage and the MIDIJACK voltage are combined to affect each other but the envelope triggering still work independently but simultaneously. Additionally, the local keyboard may be used to transpose the incoming MIDI notes, and it works very well and with good pitch stability because the Moog Source has an unusual digital keyboard circuit which will not suffer from old-fashioned sample and hold droop. The user can select either mode at any time, but may prefer to leave it in MIDI on mode all the time. If you power-up the Moog Source with MIDI on mode previously enabled, you may not be able to hear sound while playing the local keyboard. After playing something via MIDI, you will be able to play the local keyboard and hear sound. Why? This is not a failure to trigger, but rather combining the very high MIDIJACK top MIDI note 127 control voltage with the local keyboard voltage which is always fairly low due to the limited factory range of the small keyboard on the Moog Source. The combination of those two voltages is a voltage that may still be too high to hear because the fundamental frequency of the note produced may be higher that the cutoff frequency of the lowpass filter. To hear a demonstration of this, turn up the pink noise source and continue to play the keyboard. You will now be able to hear each note playing even if the VCO pitch is too high. You can send a lower MIDI note at this time to lower the combined voltage and bring the range back down closer to where you expected it. This power-up status is due to the MIDIJACK Analog Calibration Mode. When any MIDIJACK-equipped synthesizer is powered-up with MIDI On Mode previously selected before last power-down, the on-board computer causes it to automatically and silently go into the Analog Calibration Mode where the MIDIJACK #4 white wire (MIDIJACK CV output) puts out the correct voltage of the highest MIDI note, MIDI note 127, which is +10.58 volts. This can be adjusted with the scale adjustment trimmer. This note will not be heard at the audio output of the synthesizer because the gate is not active during Analog Calibration Mode. You can read more about this mode in the MIDIJACK Quick Installation Manual. If an analog synthesizer has the built-in glide function factory wired to be pre-CV/gate jacks, it will not have use of the built-in glide with external CV/gate control. The installation of a MIDIJACK is no different than using external CV/gate control, having no access to the built-in glide. If glide is required for MIDI use, an easy solution for real analog glide is provided in the Advanced Installation Manual, but is beyond the scope of these simple instructions.